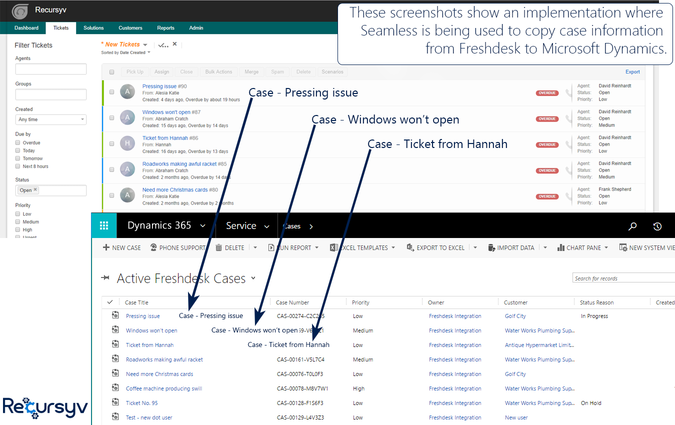 Quickly integrate Freshdesk with Dynamics 365. 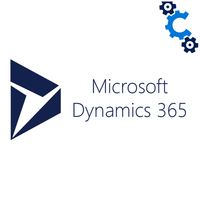 Quickly integrate Freshdesk with Dynamics 365 using Recursyv Seamless to power data syncing. The synchronisation options allow you to quickly setup syncing of data between Freshdesk and Dynamics. Sync Customers (Accounts) & Contacts to keep customer master data up-to-date in both systems. Updates made in one system will synchronise to the other. This allows different teams (e.g. a helpdesk team and a sales team) who are using different systems work off an up-to-date data set. Freshdesk -> Dynamics Ticket sync provides a reference view of Freshdesk tickets within Dynamics. Tickets will be updated into Dynamics cases allowing users in Dynamics to view ticket progress. Updates to tickets need to be made at source (i.e. within Freshdesk). Once setup, the integration is operated as a managed service by Recursyv. 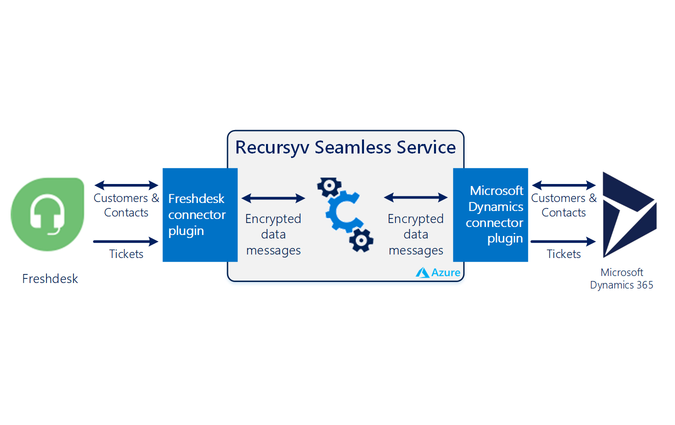 In order to provide connection details for each application (Freshdesk & Dynamics 365), you will need to contact Recursyv. In the course of this conversation, we will confirm data mappings, refresh frequency and any other requirements.